Comments: Broadleaf flowering deciduous tree native from China to India. Palmately compound leaves, and bright lilac blue flower shoots in summer. Though this species is native to wetter and more humid climates, it'll do well here when watered. Specimen is 10 to 12 feet tall and broad spreading. 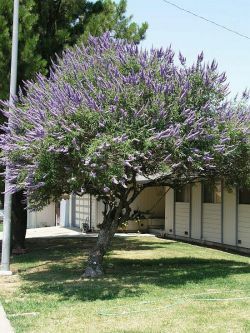 This tree was identified by Bill Merrill of Fremont.